2 What Is A Golf Wedge And What Are Its Uses? Close to a quarter of all the shots that you will make when on the golf course will be with a wedge. And so wedges are an integral part of the game and having the best will always influence your performance significantly. Although most golfers know that they need to have a wedge in their bag, many do not understand how to choose the right one or the essential traits to look for in the best wedges. Wedges can save pars and also create birdies, but just like any other golf clubs, they can also cause some problems if you do not have the right one. If you are one of the many golfers that tend to struggle around the green, you will have even more problems without the right wedge for the shot you want to make. And so it is always vital to ensure that the golf wedges that you have in the bag add some value to your game and will assist you in scoring. What Is A Golf Wedge And What Are Its Uses? The golf wedge has the highest loft in a club set, and its primary role is for short approach shots. Most golfers will use it when they are 120 yards away, for strikes played out of the sand and for pitch and chip shots. Also, these are always the clubs to turn to when you want to make shots where the balls ascend/descend sharply. Technically, wedges are irons, but most golfers will think of them as specialized irons or as a subset of the golf irons. But, nowadays most people will even classify them as a distinct type of clubs that perform different roles from the regular irons. Although the pitching wedge is the most common of these golf clubs, they are still a few other types that provide more shot options. Whether you are a professional playing in a tour or are just learning how to play golf, you will need to have at least two types of wedges in your set. Wedges will offer you many options when playing from various parts of the course. However, to get the advantages that come with this golf club, it is always important to choose the right ones for your game. And for this to be so, you should understand the following important things and keep them in mind when shopping for the best golf wedges. The most important aspect that golfers should understand when it comes to the wedges is the types. There are four main wedge types which are the pitching, gap, sand and lob wedges and they are all handy when on the course since they are suitable for different shots. The pitching wedge (PW) is the most common and also the oldest wedge type. It also has the lowest loft, and in most instances, this will be between 44 and 50 degrees. Most golfers will use this wedge for long chip shots and when making full shots into the green. The average shot of the pitching wedge is between 110 and 140 yards, and so it is very reliable when making approach shots when on the rough or fairway. As their name suggests, the gap wedges are for filling a gap in the wedge lofts. And so they tend to have a lower loft than the sand/lob wedges and more loft than the pitching wedge. The most common ones will have a loft of between 46 and 54 degrees. If you make a firm swing, you can expect to get a distance of 90 to 110 yards when swinging these wedges. And so they are quite handy when the shot is too short to use the pitching wedge and too long for sand or lob wedge. Sand wedges are what most golfers turn to when on the bunkers and sand traps. These clubs will have a loft of between 54 and 58 degrees, and although they are handy when hitting the ball from the sand, you can still use them anywhere. They can strike a maximum distance of 90 yards, and so they are ideal for a short chip shot and for an approach shot to the green. Lob wedges will shine when it comes to getting the ball to the air quickly. But since they have a loft of between 60 and 65 degrees the maximum distance that you can get from them is 70 yards. The lob wedge will be a perfect choice for short approach shots and short chips. However, they will also come in handy when you want to make shots that fly into the air quickly. Almost all wedges will come with steel shafts, but it is also possible to get ones with a graphite one if they are a set of other clubs that also have graphite shafts. In these clubs, the flex is not always important, but most will come with a standard flex which is similar to the stiff ones in other golf clubs. However, the flex on the wedge is designed to cater for the short nature of these golf clubs. The other important thing about the wedge shaft that golfers should know is that you do not have to match the flex with your other clubs since you will not need to swing them 100% provided you know how to use them well. The wedge loft is the angle between or at which the club face will lie relative to the shaft. The loft is an important feature of this club since it is what determines how far the ball will go and its trajectory. Wedges will have the highest lofts in a golf set, and it is always recommended to have wedges that have a four-degree difference. For example, if you have a 50-degree pitching wedge you should have a 54-degree gap, 58-degree sand, and a 62-degree lob wedge. The bounce is the part of the club that will hit the surface, and it “bounces” the wedge through the surface when it makes an impact with the ball. But, the bounce is also the name for the elements involved in the design of the sole, and they include sole width, bounce angle, leading edge and also the camber and rocker of the wedge. When it comes to the bounce, in most cases the description and discussions will refer to the bounce angle. Bounce angle will be the angle between the leading edge and the point where the club touches the ground. Most people assume that the wedge sits flat on the surface, but this is not true since it has a bounce angle that prevents it from digging into the sand or turf. The low bounce wedge is one with a bounce angle of between 4 and 6 degrees. These types of wedges will be best suited for golfers that tend to sweep the ball and take a shallower divot. Also, they are ideal for use in firmer turfs, bunkers with a little sand and also in dense and coarse sand traps. The mid bounce is any wedge with a bounce angle of between 7 and 10 degrees. These wedge types are the most versatile and will be ideal for use in a variety of conditions and various swing types. The high bounce wedges are those that come with an angle of more than 10 degrees. With these wedge types, the leading edge will tend to sit higher when you rest the sole on the ground. The high bounce wedges will be ideal for the players who tend to dig at impact and take deeper divots. Also, they will work best for soft turf conditions and for bunkers that have some fine sand. The grooves on the wedge face are like treads on a tire since they grab the ball just like the tread grips on the surface. Grooves help to create a spin, and they also create the right shot trajectory. In the past wedges would have deep grooves but a recent USGA rule change eliminated them since they would give golfers unfair advantage as by creating more backspin. Nowadays you can get two general types of grooves which are the vintage and laser-etching. The vintage-looking grooves will rust in a way that will compliment the feel and sound inherent in the metal. And so the wedge will take a character that will suit your playing style as it ages. For the laser-etching grooves, this is not the case, but they will maximize the spin by optimizing the ball-to-face friction. How Do I Know When My Grooves Are Worn Out? For an experienced golfer, you can tell that your grooves are wearing/worn out just by looking at them. However, this is not always easy for beginners and with some particular types of wedges. The club face might look new or in good shape but the grooves might still be in a poor state. And so you will need to rely on the feel and performance of the club to determine whether they need re-grooving or it is time to replace the wedge. One of the best indications that grooves are worn out is when the ball loses some or even most of its spin. Worn out grooves will allow the ball to roll up the face before impact since friction is lost and this, in turn, causes the ball to lose spin. Sharp grooves, on the other hand, tend to make a solid sound as they dig into the ball on impact but the same is not true for worn out ones. In its basic definition, the sole grind will refer to the additional shaping (grinding) of the wedge’s sole, and it is usually around the toe or heel. Manufacturers nowadays will offer a wide variety of sole grinds, and they create them by scraping the soles for specific shots and turf conditions. Some of the most common grinds include the following four. For the M grind will involve grinding material from the trailing edge, heel, and toe. And so with this club less sole will be in contact with the ground at any point when making the shot. It has a low to mid bounce and hence making it a perfect pick for golfers that prefer to make shots from a variety of face positions. The S grind is another standard option for both beginner and pro golfers. This sole grind features a full sole wedge that has the material ground/removed from its trailing edge hence narrowing and reducing the bounce off the sole. The S grinds are the best wedges for golfers that prefer playing their shots from a square position. Edel wedges come with some custom grinds that do not look anything like what you get with other wedges. They also offer a variety of options when it comes to the grind, but the two of their most common types are the DGR and DVR. The DGR grind features a full sole with a channel scooped in the midsole area to create a double sole like design that will provide double the bounce. For the DVR grind, you get a split design in the sole with a V-shaped bounce that will aid the clubhead when gliding through sand. After construction, a wedge is given a finish to make it look attractive. The finish that you choose is always a matter of your preferences, but it is also important to go for something functional such as anti-glare finishing. But, it is also vital to understand how each finish will wear as the wedge ages. Chrome and nickel finishes which are quite popular with both pros and amateur tend to maintain their appearance for a long time. The ones with a darker finish will wear off and leave some adorable wear marks on the face and sole which some players seem to like a lot. Unplated/raw finishes, on the other hand, will rust or wear more over time and this can increase the friction and cause more backspin. Just like with all other golf club types your handicap will always affect your wedge choice since the different bounce angles, lofts and grind will be ideal for various kinds of players. The best wedges for high handicappers or those that are just learning how to play the sport and have a handicap of 25 or more should go for the pitching wedge and sand wedge. These wedges will not only provide more distance, but they are also the easiest for them to handle. Golfers with a mid handicap which means that it is less than 25 but more than 10 should have pitching, sand and lob wedges in their set since the gap will not add a lot of value to their game and they will likely not need to use it. Professional golfers and all those with a handicap of less than 10 can handle almost any club type. And so if your handicap is below 10 it is a good idea to have the pitching, gap, sand and lob wedges in your set because they will give you more options. With the fundamental wedge features above in mind choosing the right wedges to have on your set should not be tedious. However, there are still a few other factors that you will need to take into account, and they include things like price, brand and customer reviews. For the price, the best idea is always to go for the best quality that is within your budget. When it comes to the brand, it is always a good idea to go for wedges from reputable brands like Cleveland, Callaway, and Wilson. And lastly, reading some customer reviews will always give you better insight on the wedge before you spend cash on it. 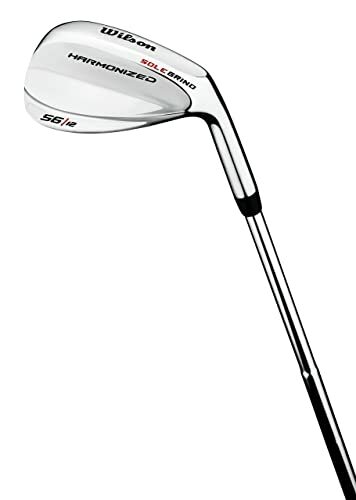 The sleek finish is what will always draw most golfers to this wedge. Also, the level of detail on the head and the fact that it makes the wedge look a little complicated is also hard to miss. Apart from the beauty of this wedge, it is also a high performing S-grind club that you can get in various lofts, and it is also available in W and C grinds. 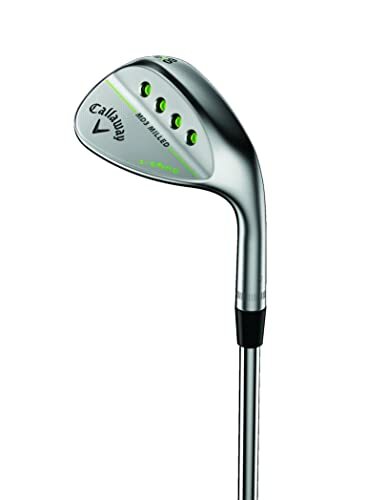 This Callaway wedge also features Advanced Shaping and Progressive Groove Optimization, and it is a highly customizable wedge which makes it one of the best golf wedges on the market. S-Grind: The S-grind makes this wedge very versatile as it is suitable for a variety of shot types, swings and also for a firm, soft and normal conditions. Progressive Groove Optimization: The Progressive Groove Optimization in this wedge features 3 milled grooves that will help to optimize the spin and ensure a smooth transition from the irons to wedge. Weight Ports: Callaway uses weight ports in the back of the clubhead to improve the shots, and this is more so when getting out of the deep rough. The S-grind is very versatile and suitable for a variety of shot types, swings and conditions. Progressive groove optimizations help to create a smooth spin transition from your irons to the wedges. It feels well balanced and is also an easy wedge to swing. You get to choose from various loft options. It is a highly customizable wedge as you can choose from different shaft, grip and finish options. You can also get this wedge in W and C grinds. It is a little expensive given that it is only a single wedge. The grip is comfortable but still not the best. Cleveland is one of the most trusted brands when it comes to the manufacture of wedges, and their products are used by everyone from regular golfers to the tour professionals. For this particular wedge, they make use of some of their most impressive technologies such as the Dual V-sole design that helps to increase forgiveness and versatility. The Cavity Back creates a clean and classic look and also increases forgiveness while the Feel Balancing tech improves impact feel. For the shaft, you also get to choose between graphite and steel and the wedge is available in various loft options. Dual V-Sole: A unique feature that entails having a V shape on the wedges sole from the front all the way to the back to ensure that you always get exceptional interaction with the turf when swinging this wedge. Also, there is another V shape (heel-to-toe) that is designed to create a narrow heel for more versatility while also increasing forgiveness. Cavity Back: Premium cavity back is incorporated to meet the needs of the majority of golfers, and it helps to create a clean and classic shape. It also ensures that golfers always get maximum forgiveness by allowing more weight to be placed on the perimeter. 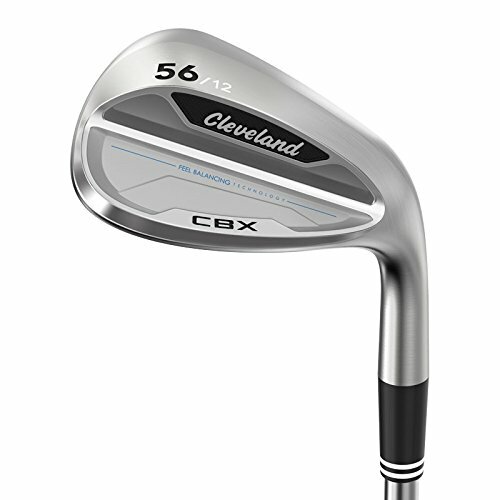 Feel Balancing: Another unique technology from Cleveland that is a design trait that allows for the positioning of the center of gravity more in line with the clubface’s center and further from the heel. This improves the feel when you make an impact and also create a tighter shot dispersion. Shaft: With this wedge, you get to choose from a premium graphite and steel shaft depending on your preferences but they both come in the wedge flex which is what many golfers will prefer on these clubs. Wilson gives this wedge a classic style which is its most outstanding feature and also the first element that most individuals will notice. If looks matter to you, this Wilson product is one of the best golf wedges for you. The company makes it with true temper steel for high performance and durability and with some aggressive grooves to maximize the spin. Also, the wedge features a distinct sole grind and modified bounce angles. It is available in the five standard wedge lofts and for both left and right-hand players. True Temper Steel: The true temper steel construction makes this a high performing and more reliable wedge. Also, the high-quality steel makes it very durable despite its affordable price tag. Sole Grind: Wilson uses sole grind to allow players to open the clubface further so that they get higher and accurate shots to improve their overall performance. Aggressive Grooves: The dynamic grooves in this wedge are an essential feature because they help to maximize the spin for more fruitful shots. Classic Style: This classic style golf club will appeal to a wide range of golfers. With this wedge, you get to choose from a beautiful high polish finish and the antiglare black chrome finish. Classic blade shape and high polish finish. The true temper steel construction makes it more reliable and high performing. Wilson gives this wedge some aggressive grooves to maximize the spin. The sole grind will allow a golfer to open up the face while still maintaining a square face angle to hit the delicate shots around the green. You can choose from five different loft angles. The harmonized grip will offer a positive and confident feel. It is a little too lightweight, and it may feel like a cheap beginner wedge. The grip is small, and this is more so if you are used to oversize ones. This wedge will not work well for you if you want to get long distances. For an affordable set of wedges like this one, most golfers will not expect much. But when you get them, the adorable and high-quality stainless steel finish will impress and surprise you. Despite the cheap price Pinemeadow still, manages to give them an appealing look and an extra-wide sole that ensures you always get a forgiving hitting surface. 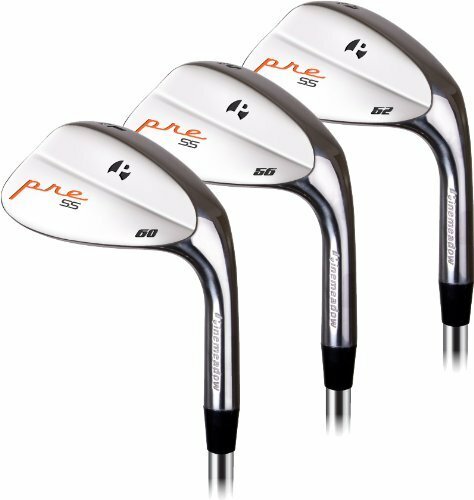 The company makes the wedges with premium stainless steel for high performance and durability, and they also feature a 125-gram shaft, U-groove technology and they come in three different lofts (52, 56, and 60 degrees). Wide Sole: Pinemeadow gives these wedges a wide sole that narrows as you move towards the toe. This design provides a more forgiving and consistent hitting surface. Premium Steel: The premium and sleek stainless steel construction make these wedges high performing and also increases their lifespan. Shaft: Each of the clubs comes with a 125-gram shaft that has a low to mid kick point to improve the overall performance of the wedges. Loft: The three wedges that you get in this pack will have a loft of 52, 56 and 60 degrees to give you versatility for a variety of shots and conditions. Groove: Like most other top notch wedges these use the U-groove technology that ensures that you always get maximum spin and also improves the trajectory of the shot. The wide soles provide a more forgiving hitting surface. Each of the clubs has a sleek and appealing stainless steel finish. It is a very affordable set of 3 wedges. Pinemeadow makes each club with premium material for durability. They come in three different loft angles. The wedges have a lightweight shaft with a low/mid kick point. These wedges are too light, and it will take some time to get used to them. The grip on the wedge is not the best, and you might have to change it. They will not serve golfers for as long as the high-end wedges. Cleveland is a famous brand, and both customer and expert golf wedge reviews will always rank them as one of the leading manufacturers. With their Golf Tour Action, the charcoal gray finish is what steals the show as it not only makes the wedge very appealing but is also very useful in reducing glare. This wedge also features Precision Milled Grooves, 431 Stainless Steel Head, Tour-trusted Sole Design, True Temper Steel Shaft and a very comfortable ActionFeel Grip. 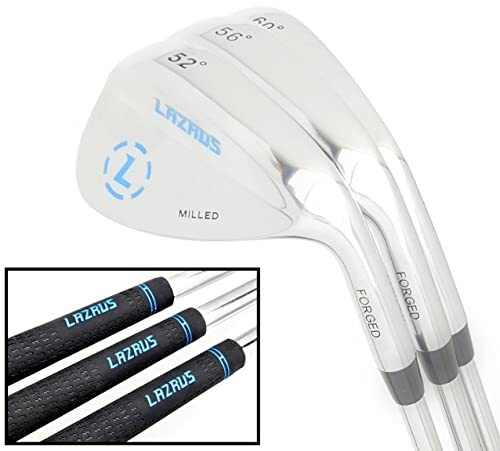 Milled Face: Lazrus gives these wedges a milled face which is one of their highlight features, and by doing so they ensure that different skill golfers will always get great spin for all their shots and best control and consistency from the rough, fairway and fringe. Shaft: The clubs use a typical wedge steel shaft but it is tougher steel that is designed to provide extra hardness and stiffness for increased overall performance and consistency. Bounce Angles: These are progressive wedges that come in 8, 10 and 12 degrees bounce angles. Besides the progression, the bounce angles also help with consistency across the set and to ensure you will have a wedge for different situations. Since you will be using the wedges for close to a quarter of all the shots that you make when on the course, you cannot afford to make the wrong pick. And with the many options in the market, you will have a large pool to choose from, and so you just need to have the right information. Knowing the different features that define a wedge, the various types and their uses is always a good starting point. But you should also remember to consider other factors like price and brand and read customer reviews so as to make an informed choice and choose the best golf wedges for your game.